Kwama are insectoid creatures that have three forms: the scrib, the worker, and the warrior. 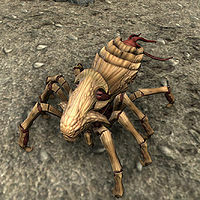 Kwama are native to Morrowind, where their eggs are an important food source for the Dark Elves. Their burrows, also known as egg mines when claimed and harvested by the Elves, are dug and expanded by the workers as the colony grows. Kwama warriors, the largest of the species, protect the workers and scrib (their larval form) from intruders. For more information, see the lore article. Some scribs are small and non-hostile, while others are full-sized enemies. This page was last modified on 21 August 2016, at 00:39.